Now inviting volunteers from April 2019 and later. Welcome to apply as a volunteer on our farm. People interested to learn about sustainability come here. They care about the enviornment and are from all corners of the world and the common language is English. They are here from two weeks to a whole season (February to November) and learn how to grow vegetables from seed to harvest. They also learn (and share) about how to cook and eat vegetarian and vegan food. You can look at the videos to see some of our focus and how the life is here. Contact Karin at:karin.d.berlin@telia.com if you are interested in helping as a volunteer and living on the farm. You can also apply directly by answering the questions below the pictures and also reading the other information and answering the questions posed in green ink. CSA members are also welcome out for the day to help out alongside our international Group of volunteers. CSA medlemmar är välkomna ut för att hjälpa till och äta lunch med gruppen. Ett bra sätt att se hur era korgar kommer till. Dessutom tar vi gärna emot volontärer från Sverige med. Kontakta Karin för mera info. We have simple accommodations (like small simple workers cottage or student room) close to our house or rooms in our other house. The farm houses are over 100 years old so do not expect new and fancy. In high season two share a room, sometimes three. Access to toilet and shower which you share with others, and computer. We have wireless internet (wifi) and computer access. We provide bedding like sheets and pillowcases. If you want to bring a sleeping bag it is good during colder months but we have lots of blankets as well. We can lend you working clothing, sweaters and even sometimes shoes or boots. It is good if you have rubber boots as we might not have your size and your own working gloves. We have pure olive soap here which we use for everything and alternative ideas about deodorant and such. Ask about it in your application letter and read more in the files below. 1. Please send your full name, place of birth, where you are now and the day, month and year of your birth in that order please. 2. We eat only vegetarian food here. We provide for vegans also. Do you have any issues around food or allergies to food or other things? 3. Can you share a room with another female if you are female or male if you are male? 4. Some of our work requires sustained concentration. Do you have a problem with this? An example would be sowing seeds and not losing the place and missing a spot. 5. Why have you chosen our farm in particular? We are into self-sufficiency, preserving the environment and would like to know your views on this, thanks. 6. From what date would you like to reserve a spot and until what date would you like to stay? How flexible are these dates? Please send your answers to me at: karin.d.berlin@telia.com ,thanks. When I have your email address I can send files about the life and work here to see if you would be comfortable and have something meaningful to contribute. -8:00: Morning meeting with farmer Anders to discuss the day’s activities. During the dark season we can start earlier to work while it is light outdoors. - If you are weeding or working in the greenhouse and it is hot you might want to take time off mid day to go swimming and then finish your row or other chores in the evening when it is cooler. -The hours we work in the day vary depending on the time of year. In the spring, around mid to late May and June, we are planting with the machine which is three seats behind the tractor and we are often on a schedule dependant on the weather. We can sometimes start planting in the afternoon and continue through the evening. We have “midnight sun” here so it is light. If you work late one evening you can sleep longer and have a shorter day the next day. -From August to November two days a week we are doing our CSA (Community Supported Agriculture) vegetable baskets. January through April we have CSA basket once a month. Also on those days we may depart from our usual schedule. This is what we usually do but cannot promise exactly as the weather tells us what we can do at different times. Jan: Cleaning and preparing the different living areas for future helpers. Some repair work on the house. Sorting vegetables and preparing orders for the schools and day care we sell to. Working in the woods with Anders. Cutting with electric wood splitter and stacking wood. Doing the fire. Sorting veggies. Baking around once a week. Warm clothing required for both outdoor and indoor work. Good to bring your own gloves and waterproof pants and warm boots. CSA basket once a month. Feb: Orders for the various places we sell vegetables to (see above in January). Working in the woods with Anders. Cutting with electric wood splitter and stacking wood. Sorting veggies. Starting to sow seeds indoors for later planting out in fields. Baking around once a week. Making and tending the fire. Warm clothing required for both outdoor and indoor work. CSA basket once a month. Good to bring your own gloves and waterproof pants and boots. March: Sowing seeds indoors in flats. Sorting veggies. Taking care of seedlings. Working in the woods with Anders. Making and tending the fire. Baking around once a week. Helping to clean both indoors and outdoors after the snow melts. Warm clothing required for both outdoor and indoor work. CSA basket once a month. Good to bring your own gloves and waterproof pants and boots. April: Sowing and tending seedlings. Transplanting seedlings starts. Cleaning out greenhouses. Sorting veggies. Baking around once a week. Help build and put up greenhouses. Making and tending the fire. Helping to clean both indoors and outdoors after the snow melts. Possibly CSA basket once a month. Good to bring your own gloves and waterproof pants and boots. May: Planting outside sitting behind tractor depending on if possibility to plant is limited can be long hours (compensated later with free time) Perhaps helping with baking around once a week. Greenhouse work such as digging, planting and tending plants. Start weeding. Good to bring your own gloves and waterproof pants and boots. June: Weeding. Planting outside sitting behind tractor depending on if possibility to plant is limited can be long hours (compensated later with free time) Perhaps helping with baking around once a week. Greenhouse work such as digging, planting and tending plants. Possibility of building. Good to bring your own gloves and waterproof pants and boots. July: Weeding. Planting outside. End of month harvesting and start CSA baskets. Perhaps helping with baking around once a week. Good to bring your own gloves and waterproof pants and boots. August: Harvesting. Taking care of plants. Putting food by (freezing, jam making, pickling). CSA baskets every week. Perhaps helping with baking around once a week. Good to bring your own gloves and waterproof pants and boots. September: Harvesting. Taking care of plants. Putting food by (freezing, jam making, pickling). CSA baskets every week. Perhaps helping with baking around once a week. Good to bring your own gloves and waterproof pants and boots. October: Harvesting. After frost CSA baskets every other week. Packing vegetable orders. Putting food by (freezing, jam making, pickling). Perhaps helping with baking around once a week. Making and tending the fire. Good to bring your own gloves and waterproof pants and boots. November: Work in woods. Perhaps helping with baking around once a week. Maybe harvesting. You need warm clothing for both indoor and outdoor work. Cleaning indoors and outdoors. Putting food by. One or two CSA baskets. Making and tending the fire. Good to bring your own gloves and waterproof pants and boots. December: If we host volunteers it is for cleaning, repairing and renovation indoors and CSA baskets once or twice and perhaps helping with baking around once a week. Making and tending the fire. Good to bring your own gloves and waterproof pants and warm boots. We usually only have helpers the first half of December. We like people to be into simple and healthy living while on the farm. - About free time: People staying here less than a month usually take one day off a week. If here one month on occasion two day in one week is ok.
-One request is that any soap, shampoo or deodorant you would bring is free from harmful chemicals and if scented only very slightly (preferably without perfume at all). We have some lovely olive soap here for your use. -We like the atmosphere to be healthy and pleasant for everyone here. Our accommodations are rooms which two people share either in a house or a cottage. In most cases you have to go out of your living area to get to the toilet, we have an area you reach through the back door to our house which has shower, toilet for all the helpers to share and it is up to if you feel ok with sharing knowing that each person has their own idea about cleanliness. Our living quarters are simple like a student room with a bed and desk. They are as clean as you keep them as are all the shared areas like shower and kitchen. - One day a week the helpers clean together all the areas they share. -You do this during your free time just as you would at home and also clean the areas you share during the day while you use them. For example after eating always wash up and after using the bathroom always clean the sink after you. In your answer please let us know your thoughts about this. -We like to have people here who think in terms of conserving water and electricity especially at high summer when we can have as many as ten helpers here at one time all sharing the facilities. If you are used to taking a shower every day please consider that at the farm we are careful with natural resources like water. -There is a nice lake within walking distance and a river with a water hole here on the farm. -This farm often attracts vegetarians and vegans and that is the kind of food we prepare here using the vegetables which we grow here. We can teach you how to live this way. We hope you will respect our way of life and only eat meat outside of the farm on your day off. -We are happy to have you here helping us and want to provide you with all the necessities you need to eat. We also have loads of wonderful vegetables fresh or in the freezer for your use. -Among other things we provide our own herbs for tea, black tea* and coffee*, milk products, oats for porridge, home baked bread from our own grains, dried beans and peas for eating and making paste, pasta, oil, our own apple cider vinegar, naked oats to make oat milk out of (one of the things we teach), salt and sugar but not honey which we buy from the beekeeper who has hives on our land because we buy it but you can buy it for the same price as we do. We also buy eggs from a local producer when we can. Any jam we have here is from our apples or raspberries. If there is none left we buy jam. -*We provide limited amounts of imported foods. If you want fruit there is a good selection you can buy yourself in the store. We have raspberries, strawberries and apples in their seasons and try to make jam or dry them for later but in the winter so far these things have been already consumed. If we can find Swedish apples we can buy them but they are usually not ecologic, but the Swedish part is good for the environment. Are you ok with taking a turn cooking regularly? Do you accept buying your own “luxuries”? -The farm is within walking of a village. There is a well-stocked store only two kilometers from here if you want to buy sweets or other foods which we do not provide. -This is a drug free and nonsmoking farm. We also have a no alcohol policy on the farm itself for several reasons. -Are you ok with this? -If you want to travel light we have lots of working clothing to lend you in most sizes. It is good if you have your own gloves and waterproof pants. We have some boots and shoes and you can write to see if we have your size. As these are not always perfect it is good if you can bring rubber boots as well. -As we do not run the washing machine so often it is good to know this before coming here and bring clothing to change into or borrow ours. When your clothes are all dirty it is ok to wash them in the machine. -If you have a sleeping bag this is fine but we also can provide sheets and other bed things so you can be comfortable. -Although a person may get a temporary health problem while travelling, like a cold, we cannot accept people with chronic illnesses or eating disorders. -We do not expect you to know about farming before coming here. As long as you are willing, healthy and active you will be a fine helper. The two references below show what you can learn on the farm and we really appreciate applications from people who would benifit from this and carry the knowledge of sustainability and respect for natural resources into their lives to share with others. This includes learning to make food from what is available different seasons. We are very far North (60th latitude) so our seasons start much later than Southern climates. Hayley Hirt, USA: I learned SO much at Ramsjö Gård! I not only learned about concepts of organic and sustainable farming, but I think the most valuable thing I learned was how to live very simply. We made almost everything that we ate from scratch (hummus, peanut butter, oat milk, pies, jams, etc.) and learned concepts of fermentation and storing food. I still use these recipes in my everyday life. I also learned how to work as a productive team member and honed leadership skills. Working at Ramsjö Gård was a truly enlightening and life-changing experience and I highly recommend it if you are a hard-worker, a self-motivated learner, and have a flexible attitude. Karins comment: We like to attract people to the farm who have interests similar to ours as you get the most out of the visit. Try to figure out what season you would do best here as the above volonteer was here at a time she got the most from her visit. 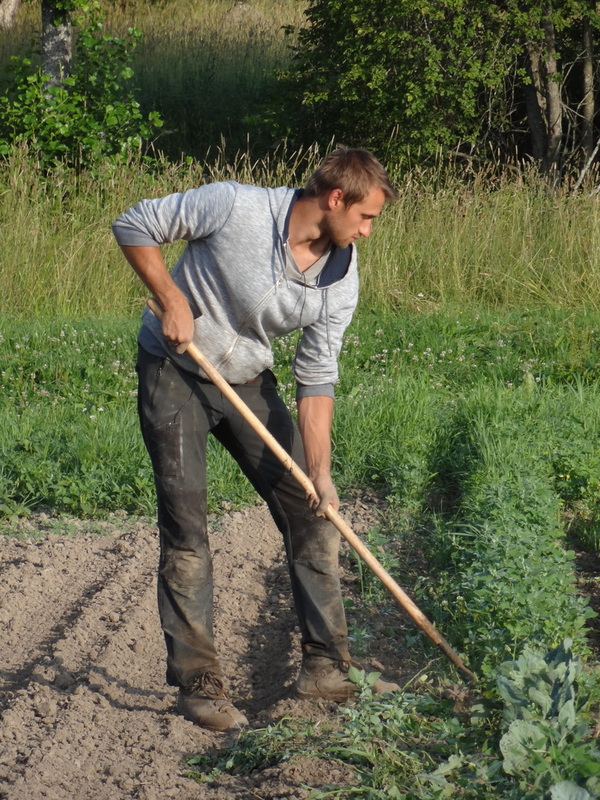 Tobias Lanzl, Germany: First of all, I enjoyed my stay at the farm and I can wholeheartedly recommend it to everybody who wants to learn about a sustainable way of living and farming in general. Not only was the stay so enjoyable because Karin and Anders are most likely some of the most friendly and kind persons I have met so far (which sounds like an exaggeration, but isn't) but also because they are really knowledgable about what they do. Since I am studying agricultural sciences I already knew a lot of things about agriculture in general, but they were still able to teach me quite a few things and especially to give me a new perspective on some things. Some might find the accomodations simple and spartan, but since you are staying at a farm with sometimes many people it's way better than it should be expected, especially considering the really friendly and welcoming environment. Summarizing I can really recommend it to everyone who wants to learn more about organic agriculture and sustainability and I hope that I will be able to visit them again. Thank you Karin and Anders for the valuable and nice experience! Karins comment: It is a plus if you are studying agriculture or sustainability but not neccesary as we will teach you while you are here. But those who do best here are genuinely interested to learn .